Well I guess it is about time to post a few pictures of my progress. Mine is a 289 FIA with a Mike Forte 302 (306) motor and a tremec TKO 600. Pretty much a standard 3-link car with 15" pin drive wheels. I took delivery in May 2017. I believe I have drilled my final hole in aluminum panels, although I am certain I have forgotten something. Next steps, brake and fuel lines. Again, thank you to all who have been so helpful on the forum--Paul, Chris, Dave, Pete....etc. It would be a struggle without you guys. Nice and clean! Love the tires too! Did you test fit the roll bar yet? Easier to trim the floor panel and drill the frame for the foot before you rivet the panel in place. Thank Chris. As you can see, I have basically not riveted anything in place yet. I'll begin doing that after the brake and fuel lines are in...maybe some of the wiring. Truth, this car will not have a roll bar. I am going more for a touring sports car look. With that said, I have not cut the chassis mounts for the roll bar out. I'll see how it goes. Looks great Joel, nice craftsmanship. I also love the tires. I'll send a pic of my front suspension tonight, I saw your post about that. I don't remember the upper a arms being mounted on top. I remember a clean workspace like that before the sanding started! Awesome. Looks like your build is coming along well. I've not posted much progress related to the build of my 289 FIA. There just seems not a lot to show that is different and frankly I am humbled by the quality and workmanship that so many others do here. In any event, here are some pictures of my progress to date. My plan is to have the motor in by the end of November. We will see! I decided to follow the lead of EdwardBs anniversary build with regard to the locking gas cap. Here is the finished product. Will mount the entire cap on the body as in Erik's Black Mamba build. Like so many others, I have mounted the master cylinder reservoirs on the chassis 3/4" tube. I used stainless hoses per Jazzman's build and routed them through the unused hole for the mechanical clutch cable. My routing of the brake lines front and rear are also pretty typical and follow basically EdwardBs in the front and Papa in the rear. Lines are nickel copper and consumed about 25 feet of the stuff. Considering that I ruined another 20 feet or so with bad bends and miscalculations, it was a total of 45 feet. Good thing it's cheap!!! I'm waiting for my power bleeder to arrive to finish this job. About two weeks ago I finally removed the chassis dolly and rested the suspension on these skates. This was a milestone of sorts and allowed me to see how things would settle and assess potential clearance issues. So far, so good. These next shots are of the fuel system plumbing beginning with the inline electric fuel pump. Mine is a carbureted motor with a perfectly good mechanical fuel pump so you are probably asking yourself, why? Well, there is some period correctness involved I guess but more so I wanted the flexibility to convert to EFI at some point down the road so in addition I plumbed in a return line and a bypass fuel regulator. I'm sure I will regret it all at some point but who knows. I have a similar set up on another car I own and it's worked well for normally aspirated and EFI. Hard lines are 3/8" steel with -6 Aeroquip StartLite flex hoses and fittings. Inline pre and post filters are Holley units mounted in the rear and under the passenger floor. My electrical harness is all in, routed and secured. Here again I didn't really follow the manual. Fuse panel is in the standard location with the EdwardBs little bracket modification to make it a bit more sturdy. Everything follows the book until the routing through the firewall which I did not do. I routed the starter/alternator and gauge sending unit wires through that small, rectangular piece just below the firewall. The rear harness is routed through the transmission tunnel cover and then follows the same plan per the manual. 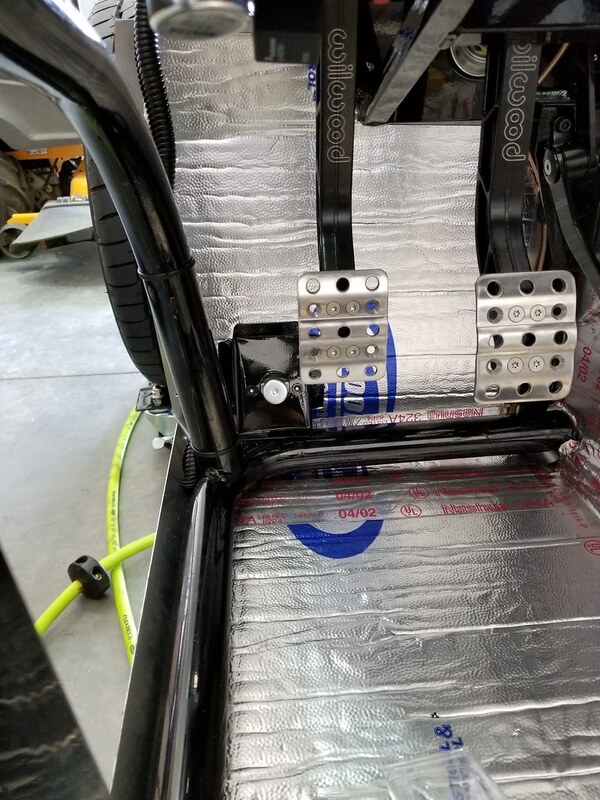 The parts of the harness below the dash will be behind the dash support which will be covered with a fabricated aluminum piece on all three sides. Battery disconnect and a line of switches will be on the front. I wanted to achieve a more clean look on the firewall so this was my rationale for doing it this way. It's a bit of a hassle when removing the transmission tunnel cover but it's doable. The battery cables will also come up through the trans tunnel cover to the battery disconnect and then back down through the cover to the engine compartment. In the end, was it all a good idea? Who knows? I ran the battery cable from my FFMetal dropped battery box a couple of days ago. I also have the FFMetal thicker firewall and transmission tunnel cover. All are very nice pieces. Battery cables are #2 gauge purchased from Summit. Cable ends are from DelCity. In this last picture you can see the routing of the front harness and the mechanical throttle linkage. All of the visible parts of the harness will be covered with the Ron Francis fabric shrink wrap. It is also available from DelCity. Just a few odds and ends....I decided to fabricate covers for the sides of the upper trunk again following EdwardBs lead. My gas tank vent ends in a II Much filtering system. Frankly I am unsure about this thing but saw it at SEMA and people say it works. We will see. Differential vent is from PPM Racing and sourced from Summit. I've laid out my dash roughly following the 289 format with a few changes. Next up--drilling the holes! Looking good Joel. I like how you ran the cables, nice use of the space. QUALITY build so far! Looking real good. The FIA is a beautiful car and not the "typical" 427. I might have one today if they were available in 2006. Looks like you read a ton of build threads and are using them for inspiration. The system works!! Looks great Joel, nice clean craftsmanship on everything. You're not alone, I wasted brake line material as well due to miscalculated bends, and bad flares on the green coated steel lines. I could not get that stuff to flair concentrically, so replace a few pieces with copper nickel..
Not a lot new to share but I am closing in on finishing the electrical so thought I would post some new pictures. Motor is going in around Christmas God willing. I fabbed up a cover for the center dash support out of .030 aluminum sheet. I used this fairly thin material because it was simply easier to bend around the tight radius of the support tubes. However, it's a little too flimsy to hold switches and whatnot so I reinforced it with some .040 that I scavenged from unused parts. They are bonded together with JB Weld. Here's a picture of them clamped. I followed EdwardBs lead, advice and counsel and utilized a bus bar behind the firewall along with an inline fuse for the alternator leg and a starter relay. The location of these parts is basically determined by other wiring and routing decisions I made related to the harness. Still I think it all works and it seems to me the use of the bus bar is just a cleaner, more organized was to get power to the right place instead of using the solenoid on the firewall or at the starter. Here are a few pictures of those pieces installed. Not as tidy as EdwardBs but then who is? This is the bus bar with the cover installed. Bus bar without the cover. In line fuse for the alternator leg. Here's the bundle of wires in the engine compartment. I swear I know where everything is supposed to go and will make sure it's all cleaned up before I finish. Second picture is currently behind the dash. Will tidy this us as well and get rid of some of the bulk in the process. Here's the pre-covered dash with most of the holes drilled and laid out. There will be two additional fluted knobs to the right of the one you see there so in a line left to right will be the light switch, wiper switch and heater controls. The second picture shows the dash support piece in place. It will be covered with leather as will the dash in the end. Mine was a blank dash from FFR. I'm wondering, what is the purpose of this little notch? Am I supposed to put a bend there? I'm still curious where the end of the dash attaches after I actually bend it and cannot find instructions related to that in the manual. Help!!! Just making incremental progress on the car. It's the holidays and hard to get sustained hours but I have done a few things. Should be ready to put the motor and transmission in around Christmas. Here's a shot of the heater and windshield wiper motor mounted. I got the tip from Dave on the use of this through the firewall plug. It's a nice, clean way to make these connections. I finally got the headlight, wiper and heater control switches sorted out with the original, classic type knobs. Here is the dash with them in their final location. As well, you can see where I have the pattern for the glove box taped in place. The 289 FIA does not come with a glove box in the stock dash so I'm making my own similar to the process that Edwardb used. It's a little smaller due to the location of the gauges. The actual box, because of the heater, will be tapered--about an inch at the top and about two and a half inches at the bottom. That's all for now. Happy Holidays to everyone. You are doing some amazing work! It looks fantastic. Great looking build. Really like the wheel & tire combo, KILLER! The FIA's are very cool looking. If you haven't completed the riveting of the PS FB, I HIGHLY recommend modifying it with the PS FB expansion, your passengers will than you for the added foot room, it is significant. (I know it means re-work, but you'll be glad you did in the long run). 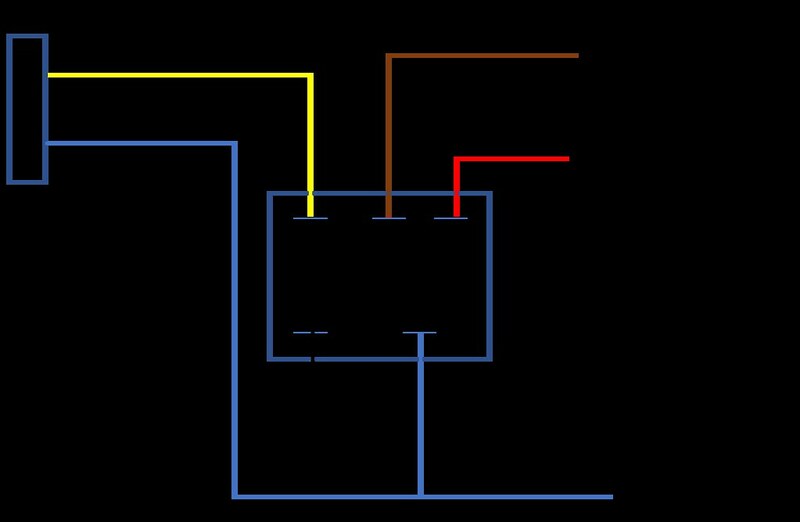 This is how I think I'm going to wire my high/low beam toggle switch using a relay so that headlight amperage does not pass through the switch. The toggle switch I'm using is the one supplied by FFR. Relay is a standard five pin automotive relay. I did mine a similar way except that I used a foot operated dimmer switch. One less thing in the dash. Last edited by Papa; 01-03-2018 at 09:33 AM. It has been awhile since I posted an update. Winter in California means it's cold out which, by most of the rest of the county's standards, is ridiculously warm. Still, 35 degrees seems cold to me in the northern part of our state so work has slowed as a result. I am getting ready to put the motor in my 289 FIA and so here are some little things that have been completed in advance of that milestone. I did opt for the oil filter relocation but did not use the factory included hardware mostly because it did not include a thermostat in the remote fixture. Overkill?....probaby, but I seem prone to that affliction. Here is a picture of the location and the fabbed bracket which I will powder coat. The bracket still needs a little trimming but I did not want to simply screw the relocated fixture to the x-member. Here is the Canton, rear sump oil pan installation replacing the stock, front sump pan. Not a lot to see here but one more step closer to getting the motor in. Thanks to Mark at Breeze for all the help on this. Note this is before I changed the block color from blue to black. Of all of the stuff I have changed, fabbed or fixed on the car the e-brake has been the most, hmmm, "irritating?" In retrospect I wish I just would have installed the electric actuator. Oh well. Thanks to EdwardB's solution to move the cables above the chassis tube. This seems to me a far more elegant solution. Here's a picture of the relocated cables and the reworked clevis at the handle. So the way I have it adjusted, it seems the cable clevis will rub against the mounting carriage bolt. I don't think this is a problem. Is this the same for others who have used this modification??? The foot boxes are finally all riveted. I have put this off until pretty late in the build so not much to see here. Again, had to do these to prepare for the motor install. From the floors back, I still have not permanently riveted the aluminum yet. The powder coat color I selected is not standard of course and so not simple to fix any nicks and/or chips created by me due to sloppy work. I sent a sample of the color to Dr. ColorChip and got a perfect match for touch up paint. It has worked well. The inside of the foot boxes, and the entire interior aluminum for that matter, will be sprayed with Lizard Skin. My firewall is the thicker version (.090) from FFMetal. It had a little "wave" due to some pressure from the foot box sheet metal so I made this little bracket to strengthen the area. I hope it does not interfere with anything when I go to put the body on. Speaking of the body, Ken at Ken's Custom Auto Body in Yuba City will do the paint on my car. I've been looking at my motor for about six months and decided I didn't like the blue paint on the block. Here is a poor picture of it repainted in black. I used POR 15 Engine paint. It laid down flat and did a good job covering. This car will have a heater. Here is a picture of the heater and wiper installation. Again, nothing that most of you have not see thousands of times before but progress for me. Nice progress Joel, very clean! Here's a picture of the relocated cables and the reworked clevis at the handle. So the way I have it adjusted, it seems the cable clevis will rub against the mounting carriage bolt. I don't think this is a problem. Is this the same for others who have used this modification??? Your build is looking great. Glad that e-brake mod worked out for you. Yes, the clevis rubs on that carriage bolt. I ground the head of that carriage bolt down some. It still has plenty of strength, and removing some height plus the marking helps. I also put a dab of grease there. Mine is working fine. Thanks! Great advice on the e-brake. Well today is a milestone of sorts. The motor is in! Of course, as you all know, there are many steps that led up to today. I won't repeat them all here. By this time everyone knows about painting the block, checking the run out on the flywheel and bell housing, mating up the parts, etc. For the sake of the chronology, I'll include some pictures here mostly because I am excited to have gotten to this point! This is the transmission, Tremec TKO, attached to the stock, aluminum Ford bell housing. Concentric run out was .008 and so I used offset dowels to get it near perfect. Pan is a Canton, rear sump from Breeze which necessitated replacing the pick up tube and a few other things. This is the driver's side view. That stainless steel braided line hanging out of the bell housing is the bleeder for the hydraulic throw out bearing. That second line out of the bell housing hole where the clutch fork would usually be goes from the hydraulic throw out bearing to the master cylinder. It didn't make sense to me that the two little lines just hung there so I fabbed up a cover. You'll see it in the second picture. It covers the big hole in the bell housing and manages the lines to keep them from rattling around. This next picture is of the transmission A frame mounted. I've not seen many pictures of this piece actually in place before the motor goes in so just thought I would include it. Temporary stands are off and motor lifted with the crane and leveler. And the motor is in. Probably a good time to say thanks to all of you who have helped and given so unselfishly of your time and knowledge. By the way, this motor is from Mike Forte. His attention to detail is great and the finish is first rate. Transmission also is from Mike. Here it is with the headers mocked up. I'm waiting on gaskets for those. Next milestone.....go kart. Nice work Joel! Can't wait to see the first start video. Looks great Joel. Before the first start, pressure up the fuel and look for any fuel leaks immediately. Then do the startup outside. Your Going to love the sound. The first go kart is exiting, fun, and scary all in one. Congrats. Sounds great! Now be honest, that's really the first time you started it? Seemed a little too easy. My first starts usually have way more drama. Congrats on your first start! Your car is looking real good. Just saw your first start video again. Awesome! Are you using the BBK shortie headers? If so does one tube on the passenger side have a pre- bent tube that restricts flow...maybe for clearamce issues on a mustang? My headers has it. Not sure if its a defect or suppose to be there. Here is a pic of what mine looks like. I purchased them from Summit Racing. Put a call into them and they sent me a new one based off Summits inquiry with BBK. According to Summit, BBK said there should not be any deformities to the tube. Unfortunately, the new ones have the same restriction. I'll call BBK later and inquire directly with them. I may ask the forum also. I see you did not use the bracket for the fuel filler assembly and you mounted it on the body. Is that working out for you? I like that set up better than what the manual suggests. No I did not use that bracket for the fuel filler. I did not have the factory cut the hole for the fuel filler in the body which left me the flexibility to mount the fuel filler to the body like both Erik Treves and Eric Hansen did on their 289 builds. I like the look much better and so far have not had any issues. I made a second rubber gasket and then placed the cap, a rubber gasket next to the body on top, a second rubber gasket on the underside, and finally the aluminum ring that comes with factory bracket. Drilled holes in the body for the screws and secured the whole thing with nyloc nuts. In addition to just looking better in my opinion, I was concerned that the larger hole in the body in order to utilize the factory bracket would be difficult to seal. Here is a better picture of what it looks like. I have not been very diligent about posting updates on my 289 FIA. Now that it has gone off to paint and I have less to do, it seems a good time to post a few pictures and sort of close the loop. Again, thanks to everyone here who has been so helpful over this past year and a half. Certainly, this has been a labor of love that would have not gone nearly so well without the help of all of you. Specifically, thanks to Paul, Chris, Peter, Dave and the list goes on and on! Like so many of you, I undercoated the body. Nothing very earth shattering here other than the product I used was different than what is generally chosen. Raptor Liner is a two part catalyzed product that is sprayed on. It's intended use is for truck beds and hot rods and it seems pretty much impervious to just about anything. I used a little over three quarts to do my two coats. It is an interesting product. It dries to a black satin finish and is hard to the touch in about two hours. It takes 48 hours to cure fully and is a hard surface yet flexible. I'm happy with how it turned out. Like so many others I installed a fresh air system using bilge fans from Amazon and flapper valves I ordered from Finishline. I am happy with the installation and it seems to work well. The second picture here shows the under dash pull that opens and closes the flapper and the variable speed switch that operates the fans. The switch is actually a solid state speed controller that I ordered from Amazon. Edwardb, Paul, my electronics guru suggested it and after some initial connection issues mostly involving a bad ground, it now works flawlessly. In this picture you can also see the gas pedal from Russ Thompson. This is a very nice piece and in my mind a great upgrade from stock. The hoses for the fresh air system are from Summit racing and are rigid but flexible if that makes sense. They are a little expensive but really do the job well. The cooling system pipes are stainless pieces from Bob Boig and are very high quality. You can see the upper in the picture. The lower one looks similar. My cooling system is a little non-traditional and uses a Harrison tank mounted up front. Bob was really very helpful with this and was able to get me the right hoses in lengths and angles that worked for this application. You can see the overflow tank in the third picture mounted to the inside of the F-panel. Anyway, it all works and is reasonably period correct for the 289 FIA which is the "look" I wanted. If any of you are reading and want to respond....in the third picture there is a little fiberglass triangle that sticks out above the driver's side foot box. Does anyone know what that is for?? It's all the little details that seem to take the time. I got the body positioned on the chassis and it literally took me a week to get it located working by myself. After a bit of body trimming with a pneumatic body saw I was able to get the Q-jacks in the right position. I think the larger Q-jack tubes and grommets from Finishline look good with the powder coated parts. I may powder coat the Q-jacks in chrome at some point but that really depends on the final color for the car. The windshield went in easier than I anticipated and thanks to a lot of input from folks on the Forum I was able to get it positioned correctly without too much hassle. The same is true of the windshield wipers installation. I used Paul's approach with a stepped bit to drill the holes and replaced the rubber bits with steel square stock cut at an angle and attached with JB Weld. This car as an oil cooler and remote oil filter with a thermostatically controlled valve. They are all nice billet parts. The actual oil cooler is a very tight fit in the space on the 289 and probably will require some adjustment during the bodywork phase. I like the look of the Lucas headlights. I guess there are lots of other more efficient options for lights but these just seemed to fit the period. Thanks Dave for the advice and help here. On the original 289 cars the Q-jacks are in a position that would seem backwards to some. I guess they can be done either way. For now I have them like the original cars. The rear body fitment was the most challenging for me. Thanks for all of the advice from Chris and Peter. Lots of trimming was required but it finally settled in and I got the rear Q-jacks in the right place. The LeMans style gas cap is mounted to the body as with Erik's Black Mamba. I just think it looks better and doesn't let the weather in. Inside the cap is a locking gas cap consistent with Edwardb's anniversary build. I am not good nor do I have the patience for bodywork on fiberglass. I know my limitations! I have basically zero clearanced the trunk lid, hood and doors, installed them and left it at that. Ken Pike in Yuba City will have to take care of all of the rest. Honest, even zero clearance of the doors was a nightmare. Thank goodness someone else will do the final work. The trunk prop is from Lokar and is a very simple mechanical piece. Most difficult part was fabricating the lower bracket. It all works and I am satisfied with how it turned out. Simple...form follows function. I will never get used to the off-angle of the seat. I used the Breeze seat brackets and really like them. Regardless of the odd angle, it all works and fits me well. This picture shows the interior. I got the fluted knobs from Superformance, and will cover the transmission tunnel cover with leather like Paul and Dave. My plan is to attach as Papa(Dave) did with hook and loop. Thanks for that advice. The rear view mirror is a Raydot with a bracket given to me by Chris. The side mirror will be the same. Again, this is the period correct application. My side pipes are ceramic coated in sort of a mat chrome finish. They will match the final color of the car. The pipes themselves were gutted by Bob Boig and the muffler section replaced. The sound of the car as a result is perfect. Thanks Bob for all of your help. She is beautiful, even before paint! You really nailed the period look. Great job! Joel, looks fantastic. Your attention to detail is evident everywhere you look. I like the trunk support cylinders, it looks like a nice arrangement.